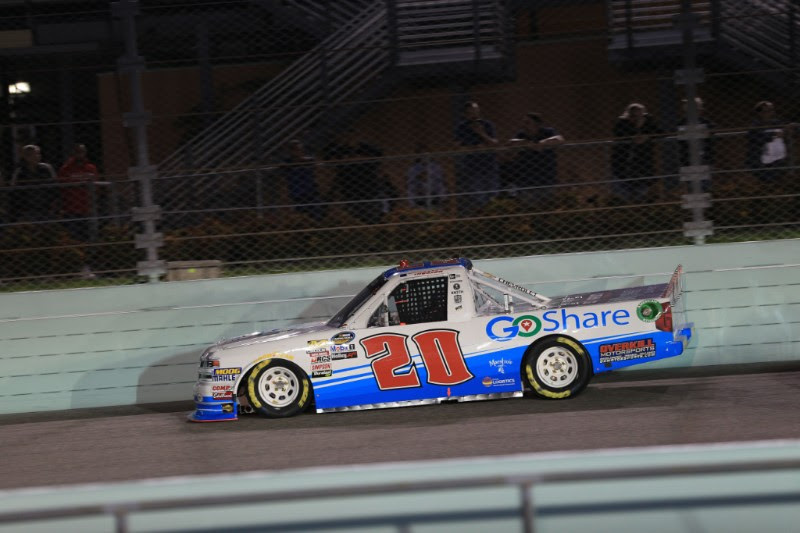 Austin Hill made his third start at Homestead-Miami Speedway and the last of 23 races in his first full-time NASCAR Camping World Truck Series season Friday evening in the Ford Eco Boost 200. After qualifying the RANDCO Chevrolet Silverado to start 16th, Hill maintained position inside the top-15 and running as high as 11th-place before a long pit stop put the No. 02 team one lap down. The twenty-four-year-old battled to get his lap back and finished the race in 21st-place. The Winston, Ga., native took the green flag for the 134 lap finale from the sixteenth-position. The No. 02 pilot remained quiet on the radio for the duration of the first stage and was scored in 14th at the green and white checkered flag on Lap 30. Under caution for the stage break, Hill reported his truck had loosened during the run and was called to pit road. Crew chief, Chad Kendrick called for four tires, fuel, and adjustments to snug up the No. 02 on Lap 33. The field took the green flag for Stage 2 on Lap 37 with Hill restarting from the twelfth position. On Lap 52, the twenty-four-year-old communicated his truck was “really, really loose - center off”. Spotter, Mike Herman, Jr. instructed: “just hang on to it buddy, eight laps to go here - we’ll get you tightened up.” The No. 02 maintained position and completed Stage 2 still riding in 12th-place. During a pit stop on Lap 63, the RANDCO Silverado received four tires and fuel but was delayed in returning to the field as the team assessed a concern with the left rear hub. The final stage of the Ford Eco Boost 200 went green on Lap 68 with the No. 02 RANDCO Silverado restarting in the 26th position after an extended pit stop during the stage break. By Lap 100, Hill had advanced three positions to 23rd, though still one lap down to the leaders. The final stage continued caution free and the No. 02 pilot came to pit road under green for his final pit stop of the night on Lap 115. After receiving four tires and fuel, he rejoined the field in 22nd-place. The Winston, Ga., native took the final checkered flag of the season in the twenty-first position. Tanner Thorson made his Homestead-Miami Speedway debut behind the wheel of the No. 20 GoShare.co Chevrolet Silverado Friday evening for the NASCAR Camping World Truck Series season finale. Thorson fought loose conditions most of the night, coupled with reduced engine power before finally losing the motor on Lap 123 and being forced to the garage to finish his eleventh start in the twenty-ninth position. The twenty-two-year-old took the green flag for Friday’s Ford Eco Boost 200 from the 26th position. The primary pilot of the No. 20 truck immediately reported his GoShare.co Silverado had returned the loose conditions the team fought during practice earlier in the day. Thorson had slipped two positions to 28th by Lap 15 but was able to hang on to that spot for the remainder of the caution-free first stage at Lap 30. Crew chief, Andrew Abbott called for four tires, fuel, and adjustments to combat what spotter Freddie Kraft called “wicked loose” conditions from his view atop the roof, on Lap 35. Stage 2 restarted on Lap 37 with the No. 20 in the twenty-eighth position. The Minden, Nev., native was silent on the radio and slipped to the 29th position at the halfway point of the stage on Lap 45. Having made up his lost position by Lap 55 and taking the green and white checkered flag to end the stage on Lap 60 in 28th, Thorson reported being down on power, “speed falls on its face on the straight away,” and as well as extremely loose. The No. 20 team brought Thorson to pit road on Lap 64 for four tires, fuel, and “a big swing” in adjustments. The green flag was displayed to indicate the start of the final stage on Lap 68 with the GoShare.co Silverado in the twenty-ninth position. By lap 100, the No. 20 pilot had improved to 27th, still three laps down to the leaders. A few short laps later, Thorson reported to his team that his truck had tightened up during the run and he was changing his line off the wall to keep pace. In his last pit stop of the night, the dirt track standout received four tires, fuel, and minor adjustments to free up his truck on Lap 110. After returning to the track, the No. 20 had advanced to the 26th position before reporting engine loss on Lap 123 and being scored in the twenty-ninth position at the drop of the checkered flag.